Dando continuidade à sequência de artigos sobre a relação entre direitos de propriedade e desenvolvimento econômico, aproveito para divulgar o trabalho do historiador econômico Eckhard Höffner, cujas investigações o levaram a concluir que o avanço das publicações na Alemanha esteve diretamente conectado com a ausência de direitos de propriedade intelectual. Ao contrário da Inlgaterra e da França durante o século XIX, onde a propriedade intelectual já estava bem estabelecida, a Alemanha experimentou o seu maior episódio de expansão na produção de conhecimentos científicos e literários. Interessante é notar que apesar de a Alemanha ainda ser muito mais agrária do que seus vizinhos no século XIX, já contava com um mercado ávido por novos livros e novos ensinamentos técnico e científicos. Na Inglaterra, ao contrário, a propriedade intelectual e o grande poder de monopólio das editoras restringiam o mercado de livros para um público altamente elitizado. Novos títulos circulavam em pequenas quantidades em Londres, e os que circulavam tinham preços tão elevados que a população em geral ficava completamente privada de tal leitura. A maioria do conehcimento técnico teve então que ser transmitida oralmente e não por meio de publicações impressas. A ausência de direitos de propriedade inteletual no mesmo período na Alemanha levou a região a produzir pelo menos dez vezes mais livros e periódicos que a Inglaterra, e pôde assim massificar novas descobertas científicas e novos conhecimentos técnicos por via impressa para a grande população. Reproduzo abaixo o texto originalmente publicado pelo jornal alemão Spiegel Online sobre os estudos do historiador econômico Eckhard Höffner. Agradeço desde já ao colega Gustavo Barros por ter enviado o link para a matéria. Did Germany experience rapid industrial expansion in the 19th century due to an absence of copyright law? A German historian argues that the massive proliferation of books, and thus knowledge, laid the foundation for the country’s industrial might. Höffner has researched that early heyday of printed material in Germany and reached a surprising conclusion — unlike neighboring England and France, Germany experienced an unparalleled explosion of knowledge in the 19th century. German authors during this period wrote ceaselessly. Around 14,000 new publications appeared in a single year in 1843. Measured against population numbers at the time, this reaches nearly today’s level. And although novels were published as well, the majority of the works were academic papers. The situation in England was very different. “For the period of the Enlightenment and bourgeois emancipation, we see deplorable progress in Great Britain,” Höffner states. Indeed, only 1,000 new works appeared annually in England at that time — 10 times fewer than in Germany — and this was not without consequences. Höffner believes it was the chronically weak book market that caused England, the colonial power, to fritter away its head start within the span of a century, while the underdeveloped agrarian state of Germany caught up rapidly, becoming an equally developed industrial nation by 1900. Even more startling is the factor Höffner believes caused this development — in his view, it was none other than copyright law, which was established early in Great Britain, in 1710, that crippled the world of knowledge in the United Kingdom. Germany, on the other hand, didn’t bother with the concept of copyright for a long time. Prussia, then by far Germany’s biggest state, introduced a copyright law in 1837, but Germany’s continued division into small states meant that it was hardly possible to enforce the law throughout the empire. Höffner’s diligent research is the first academic work to examine the effects of the copyright over a comparatively long period of time and based on a direct comparison between two countries, and his findings have caused a stir among academics. Until now, copyright was seen as a great achievement and a guarantee for a flourishing book market. Authors are only motivated to write, runs the conventional belief, if they know their rights will be protected. Yet a historical comparison, at least, reaches a different conclusion. Publishers in England exploited their monopoly shamelessly. New discoveries were generally published in limited editions of at most 750 copies and sold at a price that often exceeded the weekly salary of an educated worker. London’s most prominent publishers made very good money with this system, some driving around the city in gilt carriages. Their customers were the wealthy and the nobility, and their books regarded as pure luxury goods. In the few libraries that did exist, the valuable volumes were chained to the shelves to protect them from potential thieves. In Germany during the same period, publishers had plagiarizers — who could reprint each new publication and sell it cheaply without fear of punishment — breathing down their necks. Successful publishers were the ones who took a sophisticated approach in reaction to these copycats and devised a form of publication still common today, issuing fancy editions for their wealthy customers and low-priced paperbacks for the masses. This created a book market very different from the one found in England. Bestsellers and academic works were introduced to the German public in large numbers and at extremely low prices. “So many thousands of people in the most hidden corners of Germany, who could not have thought of buying books due to the expensive prices, have put together, little by little, a small library of reprints,” the historian Heinrich Bensen wrote enthusiastically at the time. Essentially the only method for disseminating new knowledge that people of that period had known was verbal instruction from a master or scholar at a university. Now, suddenly, a multitude of high-level treatises circulated throughout the country. The “Literature Newspaper” reported in 1826 that “the majority of works concern natural objects of all types and especially the practical application of nature studies in medicine, industry, agriculture, etc.” Scholars in Germany churned out tracts and handbooks on topics such as chemistry, mechanics, engineering, optics and the production of steel. In England during the same period, an elite circle indulged in a classical educational canon centered more on literature, philosophy, theology, languages and historiography. Practical instruction manuals of the type being mass-produced in Germany, on topics from constructing dikes to planting grain, were for the most part lacking in England. “In Great Britain, people were dependent on the medieval method of hearsay for the dissemination of this useful, modern knowledge,” Höffner explains. The German proliferation of knowledge created a curious situation that hardly anyone is likely to have noticed at the time. Sigismund Hermbstädt, for example, a chemistry and pharmacy professor in Berlin, who has long since disappeared into the oblivion of history, earned more royalties for his “Principles of Leather Tanning” published in 1806 than British author Mary Shelley did for her horror novel “Frankenstein,” which is still famous today. The trade in technical literature was so strong that publishers constantly worried about having a large enough supply, and this situation gave even the less talented scientific authors a good bargaining position in relation to publishers. Many professors supplemented their salaries with substantial additional income from the publication of handbooks and informational brochures. Höffner explains that this “lively scholarly discourse” laid the basis for the Gründerzeit, or foundation period, the term used to describe the rapid industrial expansion in Germany in the late 19th century. 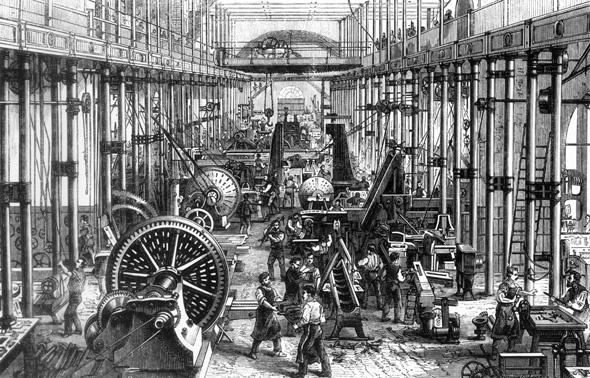 The period produced later industrial magnates such as Alfred Krupp and Werner von Siemens. The market for scientific literature didn’t collapse even as copyright law gradually became established in Germany in the 1840s. German publishers did, however, react to the new situation in a restrictive way reminiscent of their British colleagues, cranking up prices and doing away with the low-price market.